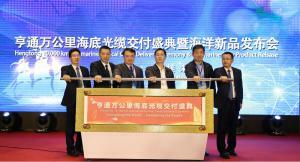 CHANGSHU, JIANGSU, CHINA, November 29, 2018 /EINPresswire.com/ — On November 26, 2018, the "Hengtong Overseas 10,000km Submarine Optical Cable Delivery Ceremony" was held in Changshu, Jiangsu Province, celebrating Hengtong's success in manufacturing and delivering nearly 3,000km of submarine optical cable to Chile FOA Project and achieving cumulative overseas deliveries of 10,000km of submarine optical cable. 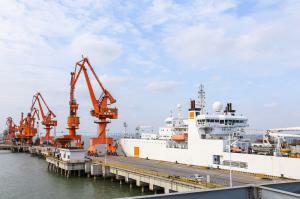 This ranks Hengtong first in the world in both capacity and delivery to the domestic submarine optical cable market. This is a milestone in China's submarine cable industry and highlights the "made in China" drive in the field of international oceanic communications. Hengtong is a global information and energy network service provider offering various kinds of wire and cables including fibre-optic, power cable, marine cable and accessories. With over 20 years of development, Hengtong now grows to have 10 manufacturing facilities based in China, Europe, South America, South Africa, South Asia and Southeast Asia. As well as sales offices in over 30 countries and regions around the world supply products and service to over 140 countries. Committing to innovation and social responsibility is at the heart of Hengtong – Hengtong is implementing and transforming to intelligent manufacturing to be one of the most advanced cable manufacturers in the world.